Marching On - News: SGeorge IV blows Ospreys off their nest. News: SGeorge IV blows Ospreys off their nest. A 5:15 kick off is a bit unusual but an ideal opportunity to try out another of the new village food franchises. If ever there was an example of consumer power surely the fact that the Fine Foods stalls have ceased to be is it. If you haven’t tried a Saul’s steak pie, chips and gravy then you could do a lot worse than treating yourself next match. Of course other food outlets are available and so far my experiences have been positive. Still pricey but I do not begrudge parting with my hard earned quite so much when the quality if that much better. Well done to all concerned. While eating we were treated to some marvellous singing by some travelling taffs, quite beautiful in fact, but that was about all the Welsh had to sing about for the rest of the evening. One thing that is becoming apparent to me is the difference between the Saints’ home and away style of play. As different, in fact, as Frank’s burgers and those of Fine Foods. While walking the dog yesterday morning I was talking to a chap who asked me how I thought Saints would do. Well, I said, on home form we should put 30 points past them. Samu Manoa led the side out for his 100th match to a standing ovation, a contribution much appreciated by the saints’ faithful. Kick off under floodlights at a packed Gardens, yours truly suitably fed and oiled and a great evening’s entertainment anticipated. Wilson started at 13 in place of the unfortunate George Pisi but Ospreys were also disrupted in the centres with both Andrew Bishop and Ashley Beck missing. Wilson, however, was forced to leave the field after only 10 minutes after being flattened in midfield and North moved to 13 with Elliott coming on the wing. and a lovely floated pass from Myler to North who swooped over near the corner. 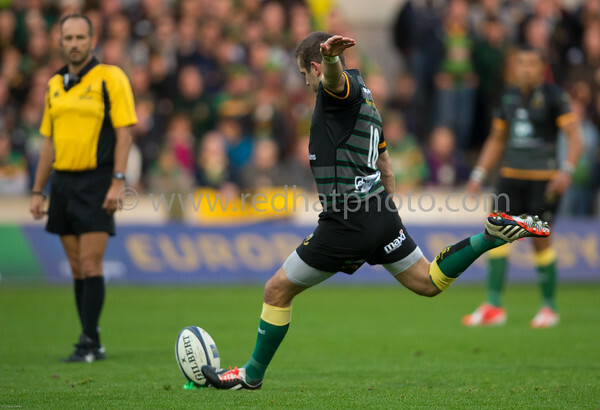 Myler kicked off an immaculate display from the tee by converting. There followed a strange 10 minutes when the floodgates threatened to burst as first Christian day then Dylan were denied by the TMO. Combined with Luther missing an overlap and Ben’s dodgy pass to Pisi earlier on Saints were butchering try scoring opportunities which could have put them out of sight by half time. To be fair under virtually any other officials, Dylan’s try would surely have stood? The French TMO adjudged Ben’s pass forward but it seemed harsh. Coming to think of it what right has a Frenchman got to judge anything forward? Nothing French has gone forward since the Battle of Austerlitz in 1805! 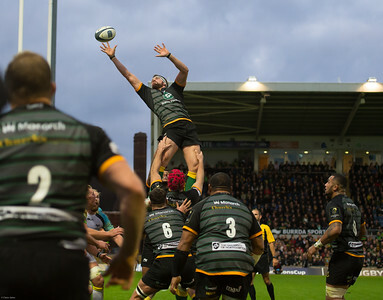 Not long after, however, the inevitable happened as a loose kick to Foden released Ken Pisi on a powerful arcing run through the Ospreys’ defence. George North took an inside pass and with a trademark change of direction and burst of speed went over the line for his second. Half time 20-3 to Saints and it could have been so much more. During half time we were treated to the sight of kahn Fotuali'i playfully disrupting the Osprey reserves warming up, obviously renewing old acquaintances. The first 10 minutes of the 2nd half could have seen Ospreys claw their way back as Luther went off with a damaged hand and the Saints struggled to gain any sort of cohesion. Will Hooley came on inside George North, (Yes that’s a Winger and a bench fly half in the centres, a fact ignored by the sky team in favour of their constant waffling regarding all Ospreys’ woes being down to Bishop being out and a disrupted centreership) A spell of Ospreys possession led to penalties being awarded and it was only the fact that on the day, the usually reliable Dan Bigger couldn’t hit a cows backside with a banjo that the margin only reduced by 3 points. Totally against the run of play George North scored his hat trick try from a lineout after Clark had won yet another penalty at the breakdown and Myler had knocked the ball into the 22. A simple crash bang ball which maybe should have been shipped onto the available Elliott, but luckily this time the TMO could not find fault. The first planned subs started to appear around the 55 minute mark and Saints had 25 minutes to secure the bonus point, surely inevitable now? Well we would have to wait until the last minutes of the game as Ospreys seemed to up their attacking game, trying anything and everything to break the Saints defence. A virtually impossible task on the night. Everybody in a saints’ shirt was magnificent in defence last night. Lawes and Woody, Dickson and Pisi, the vicious double hits in midfield to the ankle nipping terrier that is Jamie Elliot. One man who once again stood out for me was Calum Clark who is undoubtedly playing his best rugby at the moment. The huge applause he received when he was eventually replaced was testament to his performance, as well as acknowledgment from the crowd of his deserved call up by Lancaster. If a certain Welshman had not selfishly pinched all the glory Clark would have been close to man of the match, others may cite Wood or Lawes, each will have their own opinion. After much huffing and puffing the glorious end finally came on 76 minutes when Ospreys appeared to be clearing their lines. Somehow, a certain Mr North stripped the ball in a tackle, skipped past a defender, changed direction, put in a chip, accelerated like a V2 and left the desperate defence flapping at empty air like floundering haddock. Game over, four tries for Saints, four tries for George North, 5 points and back in the hunt. Another great night out at the Gardens, another comprehensive win from the Saints’ ‘Home team’. Poor old Alun Wyn Jones, who I think is a fabulous player and leader, must be starting to hate the sign for Junction 15a. Re: News: SGeorge IV blows Ospreys off their nest. Very good, especially the Austerlitz reference! A very entertaining match report! Really well observed and well written - thanks for a great report! very good. glad you drew reference to Kahn's half time warm up - made us chuckle too. Great report as always, St D.
It is very much appreciated, good Sir!